'Israel will defend its sovereignty', Israeli Ambassador tells UN, warning of plans in Gaza for confrontation with IDF on Israeli border. 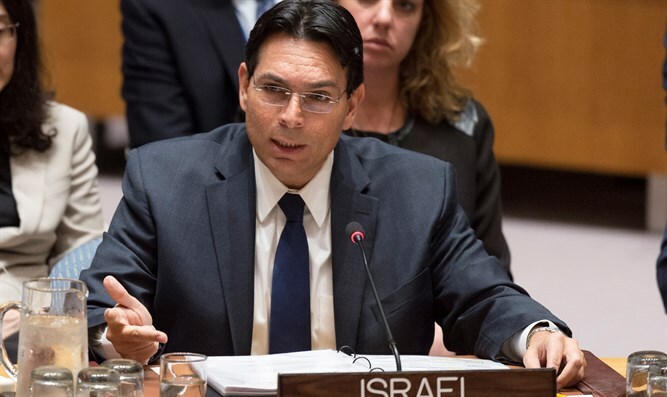 Israeli Ambassador to the United Nations Danny Danon penned a letter Thursday to the United Nations Security Council and UN Secretary-General António Guterres, warning them regarding plans by Hamas to launch a massive confrontation with Israeli forces on the Israel-Gaza border. Funded by the Hamas terror organization which rules the Gaza Strip, protesters have planned six weeks of mass protests and confrontations with IDF forces along the Israel-Gaza frontier. Beginning this Friday, the protests are set to culminate in a final demonstration on May 15th, a day after Israel’s 70th Independence Day, when the US is scheduled to relocate its embassy to Jerusalem. Israeli security officials have warned that plans by protesters to scale the border fence and cross into Israel en masse could force IDF forces to respond with force. On Thursday, Ambassador Danon penned a letter to the UN Secretary-General and the UN Security Council regarding the perils of the planned demonstrations. “I write to inform you of a dangerous effort by Palestinian leaders to create conflict by orchestrating a series of mass confrontations, specifically on the security fence between the Gaza Strip and Israel, to occur between March 30 and May 15,” wrote Danon. “In light of the Palestinians’ organized planned provocation for the coming weeks, I reiterate Israel’s right to defend its sovereignty and protect its citizens… Israel condemns the Palestinian leadership’s dangerous attempt to inflame tensions and instigate violence and expects all United Nations personnel to refrain from planning, supporting or participating in these activities,” Danon concluded.